Blank-et Your Heart with Love! 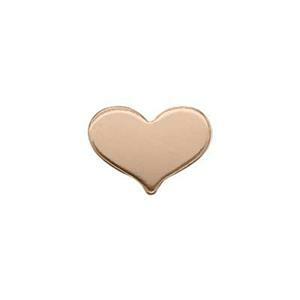 What better way to Blank-et yourself in Love than with our little GFR252 – 14/20 Rose Gold-Filled 24 Gauge Small Heart Blank! Perfect for riveting onto a larger Jewelry Design Piece. See our complete line of Riveting Supplies. Notes: Gold filled blanks are stamped or die struck. This type of manufacturing may leave light scratches on the surface. Since this type of scratching is normal it is not considered a product defect.